I think I was about 8 years old. I emptied out all the coins I had in my pocket and that was good enough to buy only one chick! I picked the fluffiest and plumpest chick and took her(?) home very carefully. As I was walking home, I imagined this chick becoming a hen and lay many eggs. And her eggs hatch and become chicks to hens, and they would yield lots of more eggs. I pictured myself surrounded by the cute fluffy chicks and gathering hundreds of eggs from their mother hens. Eggs were expensive when I was growing up, and I dreamed of selling those eggs and become a richest kid in Korea (or in my hometown at least). Well, the dream lasted only about 48 hours. I did the best I could to take care of the chick to make sure she was safe and fed right. But the chick died two days after I brought her home. I cried. And I cried even harder when the neighbor lady, who came to visit my mom and saw me crying, told me that my chick was NOT a female. She heard my ambitious plan about this chick, then she checked the bottom. (I guess she knew how to tell the gender) I am not sure I cried because I was sad at the fact that the chick died, or the chick was not meant to be a hen because the chick seller lied to me, or simply because my chance of becoming the richest kid in my hometown had gone out the window. 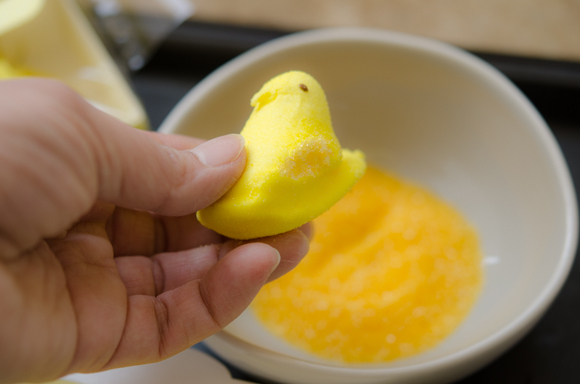 As I was placing these little marshmallow peeps on top of my Lemon Yogurt Cupcakes with Lemon Yogurt Glaze, the memory of that male spring chicks I had for two days brought me some quiet laugh. 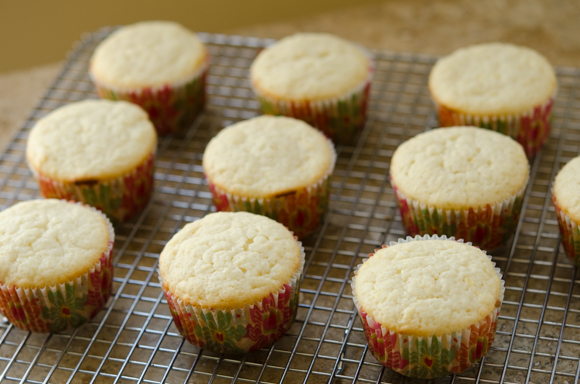 Coming to the recipe, this lemon cupcakes are really top notch. Not only it is so simple to make, it is so tender and moist, and brings the perfect tart and sweet balance. I was going to make butter cream frosting to go with these cupcakes but I am glad that I changed to simple lemon glaze using the leftover yogurt. It enhanced the flavor so perfectly. 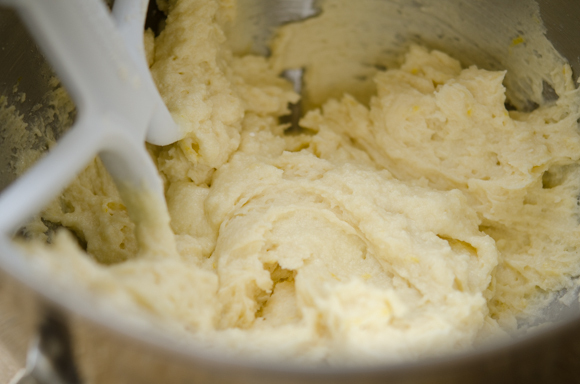 Cream the butter, sugar, and an egg in the mixer until fluffy. Add the yogurt, lemon zest, and lemon juice. Mix! Add the dry ingredients and your batter is ready-yo! Here are the cupcakes after baked. 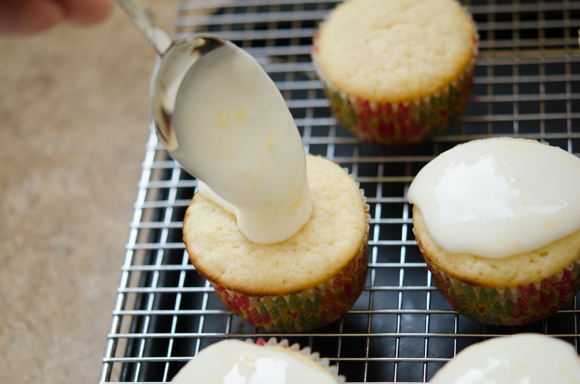 Mix all the glaze ingredients and spoon over the cooled cupcakes. Let it flow down! If you prefer thicker icing, just add more powdered sugar. I don’t like the look of white marshmallow part revealing when you tear them apart, so I just dipped them in the yellow sugar to cover up. Then, let your chicks to sit on top of the cupcakes. You are done! I like simply decorated cupcakes. I often felt so guilty of taking bites out of a cupcake that looked like a masterpiece. 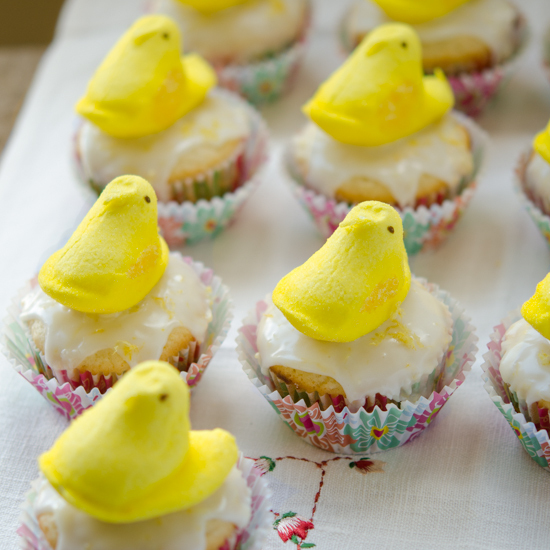 However I can picture these simple lemon cupcakes with lovely peeps nesting on my Easter dessert table. Ahhhhh…! Spring is finally here. I can almost smell it. Hope you are having a fantastic week so far! Preheat oven to 350ºF. Prepare the muffin pan with paper liners. 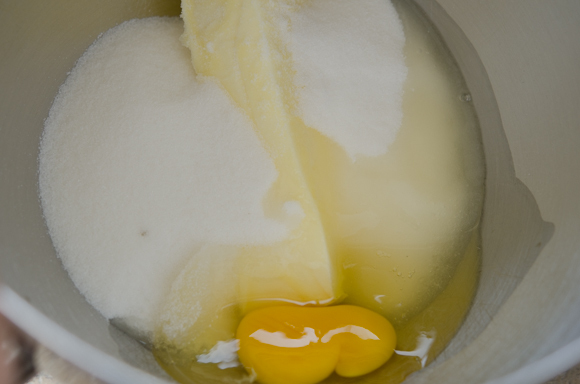 In another bow, mix sugar, butter, and egg until smooth. Add yogurt, lemon zest, and lemon juice, and beat well. 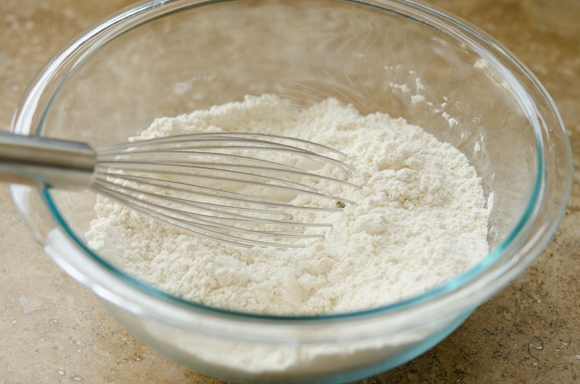 Stir in the flour mixture and mix just until combined. Spoon the batter into the prepared pan, about 2/3 full. The recipe will make about 10-12 cupcakes. Bake in the oven for 22-25 minutes or until toothpick comes out clean. Cool in pan for 10 minutes, remove from the pan and cool completely. For the glaze, mix all the glaze ingredients well until smooth. 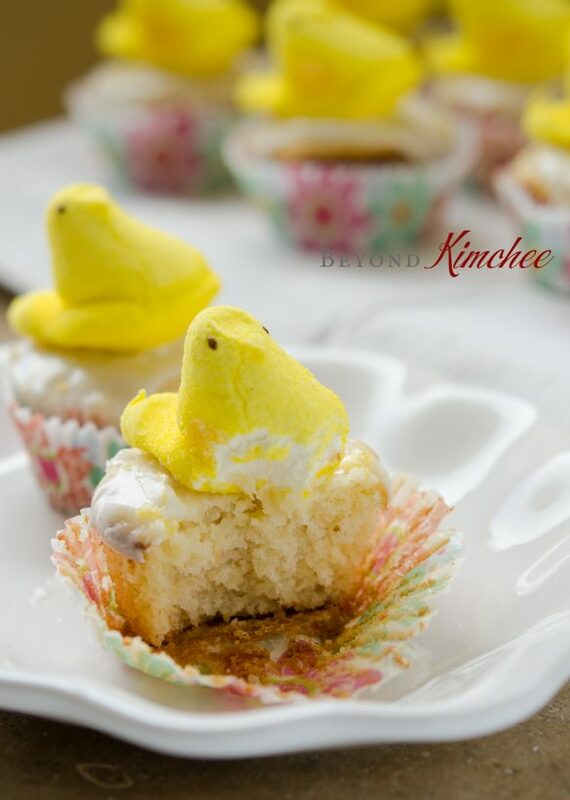 Spoon over the cupcakes, and decorate with marshmallow peeps as you like. « Rice Cakes with Roasted Mini Peppers and Tomatoes, and It’s Gluten Free! Hi Holly....I'm not a baker but will definitely try this recipe and make cupcakes for my kids. It looks deliciously and fairly easy to make. Thank you so much! This is a super easy and simple recipe that anyone can have a great result with. I hope your kids would like them. Cute chicks! And easier to deal with than the real ones. ;-) Fun story, super recipe -- thanks. Lovely story, these cupcakes look so cute too.. I'm glad I came across your page, as I want to visit korea one day! Your tale is both sad and funny! My 10 year old is always on the look out for ways to make money. I think if she read about this she would be asking for chickens too! 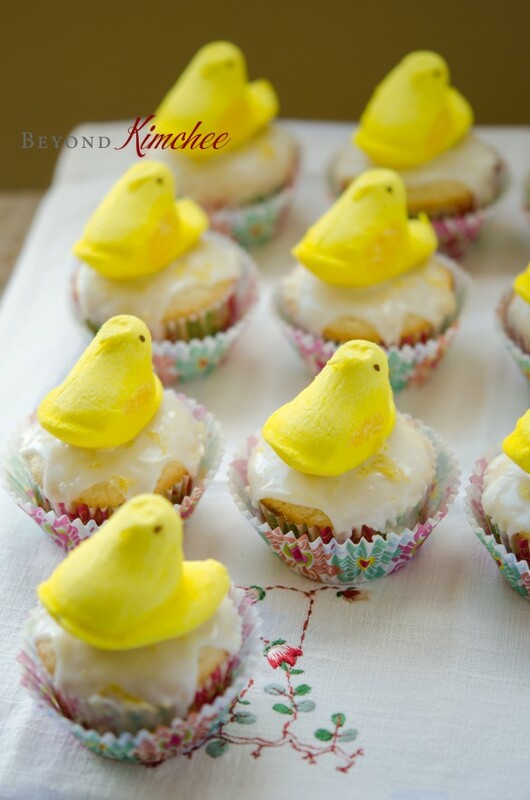 Anyway - these look so cute and perfect for Easter. I have pinned them! Holly, Those cupcakes are so lovely. I do not bake frequently but absolutely love it. 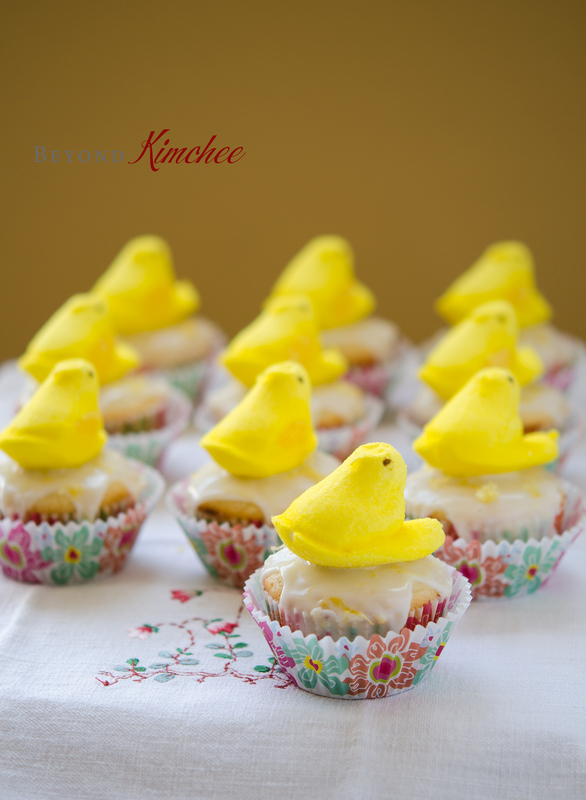 These look delicious and cute with the little chicks! olá, a receita pelo visto é saborosa mesmo e fácil de fazer, adorei os pintinhos !!! Cute story and cute cupcakes! I love lemon in cakes and cookies. Haha, what an adorable story! I had a chick, too. But, it only lasted about 3-4 days before it died. I was so sad when it died. These lemon cupcakes look wonderful! I love all lemon desserts! Perfect. My girls and I will have a egg hunt on Saturday and these will be a perfect addition to our day! Thanks. Lemon cupcakes are my absolute FAV！These cupcakes look so amazing. 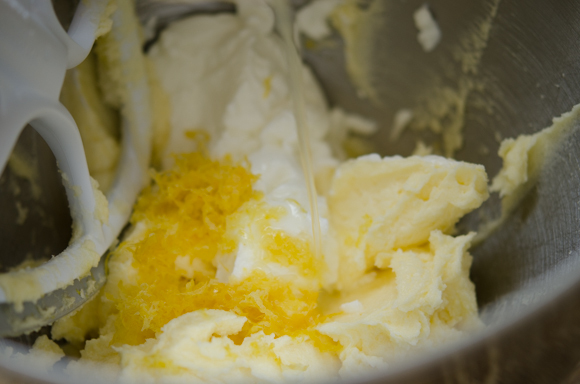 Lemon is such a great springy flavor and a great alternative to standard vanilla, and this recipe is so quick and simple. PS: Your photos are stunning! Will rice flour work with this recipe? I am not sure if the rice flour will work since I have not tried with it. I think it will bake okay but it won't have to soft and tender crumbs like wheat flour would yield. Hi Holly…. It look very attractive and appetizing. I’ll will definitely try this recipe and make cupcakes for my kids. Great! I hope they like these cupcakes. My kids love them. Thanks!